Alvindo aka Alvin is an upcoming Kenyan musician who recently joined the Kenyan music industry after releasing his hit song ”TakaTaka” that has taken over the social media. The singer has revealed that he wrote the song as one of the ways to express his feelings after being dumped with his partner. The singer seems to have a lot of privacy, Details concerning his age are still under research and will soon be updated when we come across any information. The singer seems to have a lot of privacy, Details concerning his height are still under research and will soon be updated when we come across any information. The singer seems to have a lot of privacy, Details concerning his family are still under research and will soon be updated when we come across any information. According to our research, the famous ‘Taka Taka’ hit songwriter Alvindo was in a relationship with a girl who he named Natasha but they later broke up after the girl dumped him for reasons unknown to us. The two seemed to be in a serious relationship and this is shown by Alvindo’s reaction after the two parted ways. Due to depression from the heartbreak that he believes was driven by destiny, he wrote a song to the girl expressing his feelings and emotions and this marked the beginning of his music career in the music industry. Currently, the singer is not dating and not searching because he believes that the ladies will come looking for him. The singer seems to have a lot of privacy, Details concerning his educational level are still under research and will soon be updated when we come across any information. His career in music began after he released his debut song ‘Taka Taka’ hit the music industry. A story of talent that was inspired by personal experience has made him popular and is all over TV and radio. Though many wonders who is the lady he is speaking of in this song? Well in a recent interview on 10 over 10, Alvindo revealed the name of the girl described in his song. The songwriter seems to be bored with the girl named ‘Natasha’ who dumped him. He was driven to destiny by heartbreak and live during the 10 over 10 show, they thanked Natasha for being the catalyst that put Alvindo to the ‘world’. He was later linked up with Kenyan Artist KRG the Don who expressed his intention in working with him. Some of the artists are already eyeing him for a collabo. A couple of weeks ago, Masauti said that he is open for a collabo with Alvindo. Indeed a star might sooner or later shine bright. The singer seems to have a lot of privacy, Details concerning his net worth are still under research and will soon be updated when we come across any information. Singer of banned song TakaTaka has come out to defend his work saying that it was meant to express himself. Ezekiel Mutua of Kenya Film Classification Board banned the song because it degrades women but according to the singer, he was just expressing himself. “The song basically talks about what I was going through at that particular moment. There is freedom of expression and that is what I was doing as a Kenyan. I dedicated the song to my ex-girlfriend, who had left me,” he said.” Alvindo told Kiss100.co.ke. The singer defended the song saying that it was just an expression and even before the song, there were heartbreaks. “Even before the song, there have been breakup stories and people have been left, including myself, and so I have not incited anyone,” he said. His producer KRG the Don said that the song was not for everyone. “Each song has a target audience, and that is why people even released a remix of the song because it was fun with no intentions of inciting anyone. Everyone has a right to choose the kind of music to listen to.” he posted. The recent cases of love related killings have made the government through the Kenya Film and Classification Board(KFCB) to ban music that normalizes gender-based violence. In a tweet, KFCB noted that it’s Chief Executive Officer Ezekiel Mutua was set to announce a number of songs that have been banned. “CEO Ezekiel Mutua will announce songs banned from airplay on TV and radio due to their potential to normalize gender violence and degradation of women,” reads a tweet by KFCB. The first music that has been implicated is ‘taka taka’ by Alvindo. KFCB announced that the song is obscene, primitive and abusive hence cannot be tolerated, adding that the lyrics advocate for violence against women by equating them to trash.KFCB bans taka taka due to its obscene and degrading lyrics that advocate for violence against women by equating them to trash. Content portraying women as sexual objects and referring to them using derogatory terms must be condemned and the deviants behind such evils subjected to the full force of the law. “Takataka is characterized by crude language that objectifies women and glorifies hurting them as a normal reaction to rejection,” reads a statement by KFCB. The board further said the ban means the song ‘taka taka’ by Alvin aka Alvindo should not be performed live or broadcast anywhere within the Republic of Kenya. The song is produced by Fast Cash Music of Kenya. It trended online after its amateur video was first released by the artist, Alvindo. Sensational Artist Alvindo has been on the trends ever since his debut song ‘Taka Taka’ hit the music industry. A story of talent that was inspired by personal experience has made him popular and is all over TV and radio. His Taka Taka song was an online jam even before he officially released it.But who is the lady he is speaking of in this song? Well in a recent interview on 10 over 10, Alvindo revealed the name of the girl described in his song. Alvindo said that ‘Natasha’ dumped him and this brought him to get to write the song. Speaking on whether he is currently dating, Alvindo says that he believes that ‘ladies’ will go looking for him. He was driven to destiny by heartbreak and live during the 10 over 10 show, they thanked Natasha for being the catalyst that put Alvindo to the ‘world’. “Broadcasting, exhibition, distribution (including online) or possession of this song is, therefore, a criminal offense. KFCB further issued a summon notice for Alvindo to appear before the board within 14 days failure to which, criminal proceedings will be instituted against him. “The board will proceed to institute criminal proceedings against the artist in 14 days if he fails to respond to our summons for a meeting where he can be accompanied by his lawyer. Reacting to news of the ban, Fast Cash Music Group proprietor and singer KRG The Dontermed the move ‘the best joke I have seen today.’“How can someone say that the ‘Taka Taka’ song advocates for violence against women SMH. When did a joke become so important to some people yet Kenya as a nation we have so many problems that need that attention right now!This is a big let-down to the industry at large for giving such big positions to negative minded people who do nothing to make our industry better than yesterday’s. “In fact, they don’t even know what the artists go through just to produce even a single audio track! Anyways we shall continue to produce music regardless of what they do or say. Art is Art and no one can stop it….” said KRG. 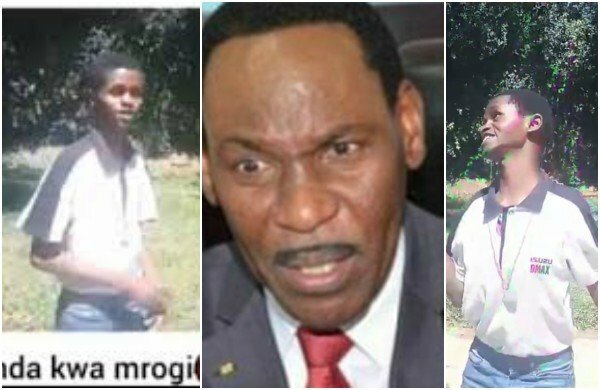 A seemingly distressed Alvindo also took to social media following the ban writing, “leo ngoma yangu imebaniwa,” accompanied by weeping face emojis.In a similar move, KFCB banned ‘Rafiki,’ a movie on two teenage girls who develop a romantic relationship for promoting lesbianism.Upon lifting of the ban by the High Court, tickets sold out Kenyans thronged cinemas to watch the film.Kenyans have in the past questioned KFCB’s mandate, with some opining that the body lacks clear-set boundaries.